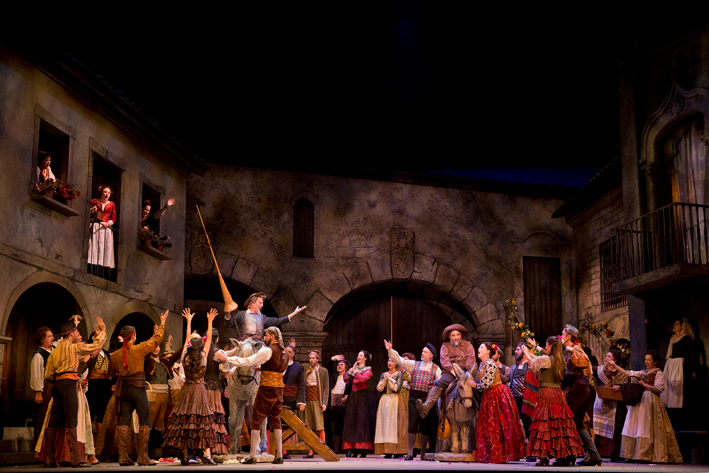 Melbourne hears Massenet all too rarely, making Opera Australia’s presentation of Don Quichotte all the more of a treat. 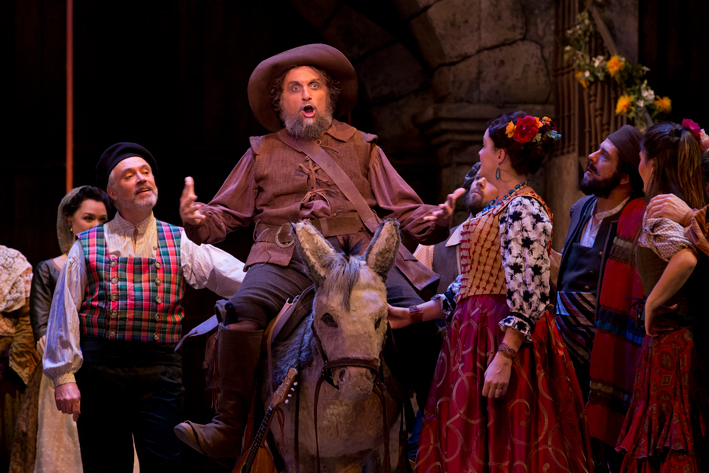 A showcase for Italian superstar bass Ferruccio Furlanetto, Don Quichotte is enjoying a boutique-scale season of only four performances in Melbourne, but it is far from a boutique-scale production. 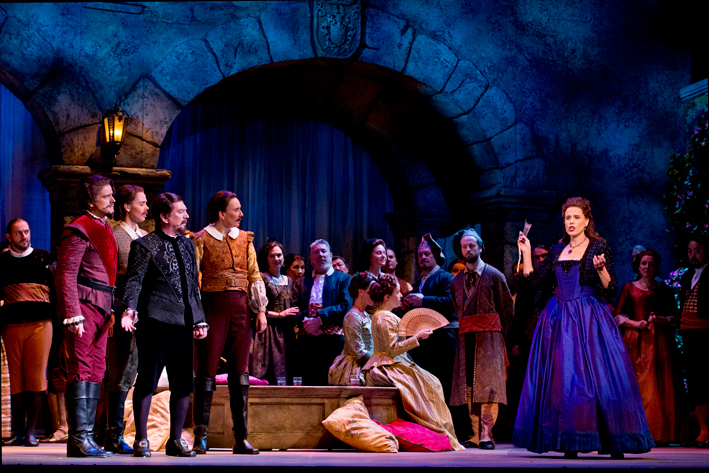 On loan from San Diego Opera, the 2009 production conjures old world Spain with grand sets and highly decorative costumes. Remaining in stellar form at a very impressive age, Furlanetto commands the stage with effortless flair. 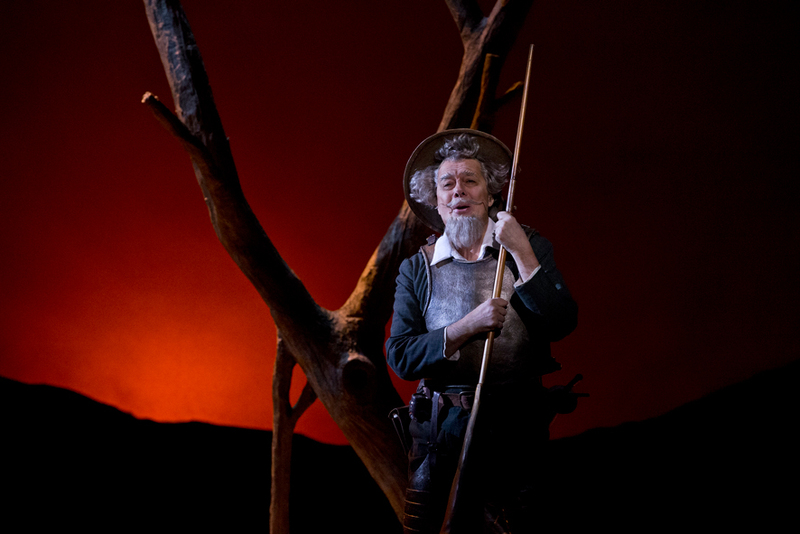 Don Quichotte is a role Furlanetto has played often, but any visible weariness is strictly that of the Don’s own character. Furlanetto’s smooth, pure bass fills the State Theatre with ease, pouring forth with unwavering power. In an evening of virtuosic vocals, Don Quichotte’s tender prayer “Seigneur, reçois mon âme, elle n’est pas méchante” is a vocal highpoint. 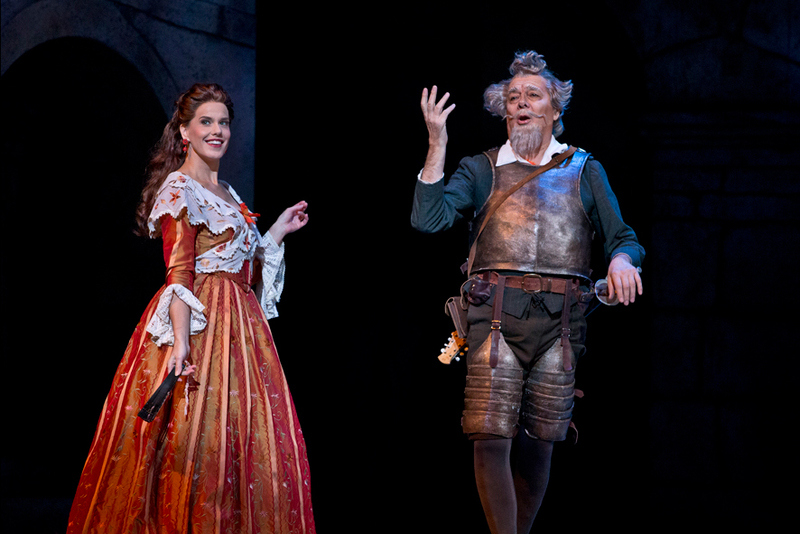 While the story originates, of course, from Miguel de Cervantes’ Don Quixote, librettist Henry Caïn based the opera on an existing adaptation, which was a play by Jacques Le Lorrain. The six acts serve as chapters in the story, with each act illuminated by a projected quote from the novel before the curtain rises. Musical theatre tragics may not be able to shake the sense that Don Quichotte is about to break into “The Impossible Dream” at any moment, but there are no such grand melodies here. Nonetheless, Massenet’s sumptuous score paints evocative stage pictures and establishes affecting emotional landscapes with expertly written orchestrations. An early indication of the musical pleasure ahead comes with a gorgeous quartet, featuring luscious, close harmonies from supporting players Graeme Macfarlane, John Longmuir, Jane Ede and Anna Dowsley, all playing male admirers of the beautiful Dulcinée. These singers are part of a very strong company of Australian singers supporting Furlanetto in his star turn. Longmuir, in particular, makes the most of an abundance of opportunities to shine. Portraying the jealous Juan, tenor Longmuir not only sings in his most dulcet tones but also cuts a dashing figure as a cavalier swordfighter. Maestro Guillaume Tourniaire brings out the shimmering beauty of the Massenet’s lovely music, leading Orchestra Victoria is a splendid performance. Musical quality is further enhanced by remarkably superb singing from the Opera Australia Chorus. Anthony Hunt’s pristine preparation of the Chorus brings out the rich harmonies with perfect balance and ringing power. In another masterful performance, popular baritone Warwick Fyfe balances the buffoon-like characteristics of side-kick Sancho Panzo with a fiercely protective air of devotion. Fyfe brings out the humanity in Sancho, underpinning the opera’s poignant finale with additional pathos. In excellent voice, Fyfe is a fitting stage partner for Furlanetto. Bass/baritone duet work is somewhat uncommon, but these are the two singers you want to hear. Having amassed a highly impressive repertoire of supporting roles, it is a genuine thrill to see mezzo-soprano Sian Pendry take centre stage in such an ideal fit for her considerable talents. In this opera, Dulcinée is elevated from serving wench to local beauty, her full title being La Belle Dulcinée. An excellent actress, Pendry enhances Dulcinée’s vanity and popularity with a clear undertone of tender humanity. By habit, Dulcinée is haughty and dismissive over the attentions of Don Quichotte, but she is quick to compassion having realised she has slighted a noble squire. Pendry’s mezzo-soprano has a dark, stately beauty that adds rich texture and expressive shading to the beautiful music she sings. It is meant as a sincere compliment to say that Pendry’s performance brings to mind the great Suzanne Johnston, both in terms of her specific vocal quality and the strength of her acting. As a further compliment, it must be stated that it is no small feat for Pendry to more than hold her own opposite the formidable talent of an international superstar. A highlight of Pendry’s performance is her soulful rendition of Dulcinée’s lament “Lorsque le temps d’amour a fui.” In an artful piece of staging, a dancer casts a shadow behind Dulcinée, which serves as an animated vision of the young woman’s melancholic spirit. 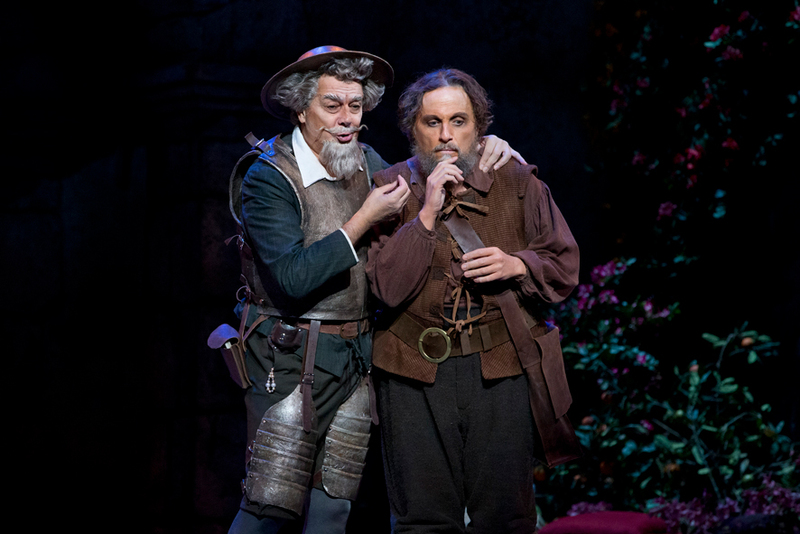 The all too short season of Don Quichotte provides an opportunity to admire Furlanetto in a signature role. The overall combination of charming music, stirring dance and high production values makes for a rather irresistible package. Don Quichotte plays select dates at State Theatre, Arts Centre Melbourne until 12 May 2018. Thanks for your feedback, Scott. It was careless of me to spell Ms Johnston’s name incorrectly and I have now corrected it.